My first venture into time travel is now live on Amazon. 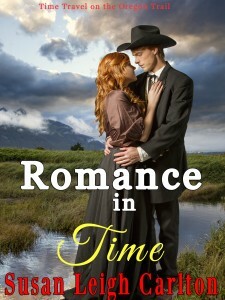 The title is “Romance in Time”. It is a historical romance set in 2015 and the 1860’s. Most of the story takes place in Laramie, Wyoming in the 1860’s. Caught in a time warp, she is transported to 1867 where she meets Thomas Barnes who wants to get married… to Abby. Can she get past her heartbreak and find love with Thomas on the Wyoming frontier? Can he face the fact she may return to her own time? *** Rated PG. The content herein contains no profanity, and one scene with violence. There is one non-descriptive sexual scene in the prologue; no more other than three chaste kisses. Heat level of 1 on the low to high scale of 1-5.